Every year Roni, our first aid officer and Dr Seymour attend a medical emergency course to refresh our knowledge and to learn of any new developments. It is about a 5 hour course when we go over medical emergency situations. Even though it’s mostly the same material, thankfully, we don’t get enough practice at work. As the boy scouts say “be prepared”. After the course, we go through the emergency equipment and check the expiry dates on the medications, and the pressure of the oxygen tank. The course is always an eye opener with a video on what a real person looks like when someone is going into anaphylactic shock from an allergic reaction. There is a You Tube video in one of the blogs about a British campaign on CPR called “Staying Alive”. It is very funny and clever. Yes you will have to look for it in the blogs below. The staff are always watching patients and will let me know if they do not appear well. We always want to know your medical conditions, allergies, and medications. Try not to leave out anything because you think it’s not relevant to a dentist. Self-diagnosis can be dangerous. It’s always best to get a medication summary from the doctor if there are a number of medications. There is an expression – “never treat a stranger”. The more we know about you, the better we can treat you. Enjoy the blog series below. 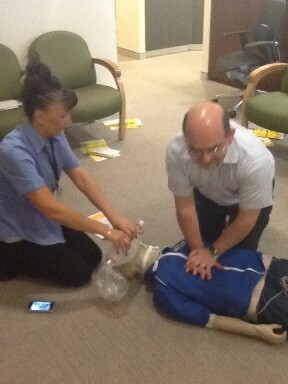 CPR – Hard and fast and staying alive! 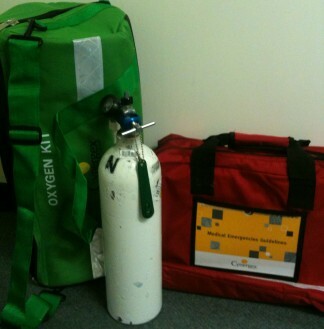 Refresher first aid course on George Green Oxygen Bag, Oxygen Tank, Red Bag - Medication & Equipment Vinnie Jones - Hard and fast and staying alive CPR. Scroll down to play video.